This article is about International Workers' Day on 1 May, a holiday sometimes called May Day. See May Day for the traditional spring holiday. See Labour Day for other labour-related holidays. International Workers' Day, also known as Workers' Day, Labour Day in some countries and often referred to as May Day, is a celebration of labourers and the working classes that is promoted by the international labour movement which occurs every year on May Day (1 May), an ancient European spring festival. The date was chosen by a pan-national organization of socialist and communist political parties to commemorate the Haymarket affair, which occurred in Chicago on 4 May 1886. The 1904 Sixth Conference of the Second International, called on "all Social Democratic Party organisations and trade unions of all countries to demonstrate energetically on the First of May for the legal establishment of the 8-hour day, for the class demands of the proletariat, and for universal peace." The first of May is a national public holiday in many countries worldwide, in most cases as "Labour Day", "International Workers' Day" or some similar name – although some countries celebrate a Labour Day on other dates significant to them, such as the United States, which celebrates Labor Day on the first Monday of September. Beginning in the late 19th century, as the trade union and labour movements grew, a variety of days were chosen by trade unionists as a day to celebrate labour. In the United States and Canada, a September holiday, called Labor or Labour Day, was first proposed in the 1880s. In 1882, Matthew Maguire, a machinist, first proposed a Labor Day holiday on the first Monday of September[nb 1] while serving as secretary of the Central Labor Union (CLU) of New York. Others argue that it was first proposed by Peter J. McGuire of the American Federation of Labor in May 1882, after witnessing the annual labour festival held in Toronto, Canada. In 1887, Oregon was the first state of the United States to make it an official public holiday. By the time it became an official federal holiday in 1894, thirty US states officially celebrated Labor Day. Thus by 1887 in North America, Labour Day was an established, official holiday but in September, not on 1 May. 1 May was chosen to be International Workers' Day to commemorate the 1886 Haymarket affair in Chicago. In that year beginning on 1 May, there was a general strike for the eight-hour workday. On 4 May, the police acted to disperse a public assembly in support of the strike when an unidentified person threw a bomb. The police responded by firing on the workers. The event lead to the death of eight and injury of sixty police officers as well as an unknown number of civilian killed or wounded. Hundreds of labour leaders and sympathizers were later rounded-up and four were executed by hanging, after a trial that was seen as a miscarriage of justice. [nb 2] The following day on 5 May in Milwaukee Wisconsin, the state militia fired on a crowd of strikers killing seven, including a schoolboy and a man feeding chickens in his yard. In 1889, a meeting in Paris was held by the first congress of the Second International, following a proposal by Raymond Lavigne that called for international demonstrations on the 1890 anniversary of the Chicago protests. May Day was formally recognized as an annual event at the International's second congress in 1891. Subsequently, the May Day riots of 1894 occurred. The International Socialist Congress, Amsterdam 1904 called on "all Social Democratic Party organisations and trade unions of all countries to demonstrate energetically on the First of May for the legal establishment of the 8-hour day, for the class demands of the proletariat, and for universal peace." The congress made it "mandatory upon the proletarian organisations of all countries to stop work on 1 May, wherever it is possible without injury to the workers." May Day has been a focal point for demonstrations by various socialist, communist and anarchist groups since the Second International. May Day is one of the most important holidays in communist countries such as the People's Republic of China, North Korea, Cuba and the former Soviet Union countries. May Day celebrations in these countries typically feature elaborate workforce parades, including displays of military hardware and soldiers. In 1955, the Catholic Church dedicated 1 May to "Saint Joseph the Worker". Saint Joseph is the patron saint of workers and craftsmen, among others. During the Cold War, May Day became the occasion for large military parades in Red Square by the Soviet Union and attended by the top leaders of the Kremlin, especially the Politburo, atop Lenin's Mausoleum. It became an enduring symbol of that period. Today, the majority of countries around the world celebrate a workers' day on 1 May. In Algeria, 1 May is a public holiday. 1 May is celebrated in Algeria as Labour Day and has been a paid bank holiday since 1962. 1 May is known as Labour Day and is considered a paid holiday. The President of Egypt traditionally presides over the official May Day celebrations in Cairo. In Ethiopia, 1 May is a public holiday and celebrated as the Worker's Day. 1 May is a holiday in Ghana. It is a day to celebrate all workers across the country. It is celebrated with a parade by trade unions and labour associations. The parades are normally addressed by the Secretary General of the trade union congress and by regional secretaries in the regions. Workers from different workplaces through banners and T-shirts identify their companies. In Kenya, 1 May is a public holiday and celebrated as the Labour Day. It is a big day addressed by the leaders of the workers' umbrella union body - Central Organisation of Trade Unions COTU. The Minister for Labour (and occasionally the President) address the workers. Each year, the government approves (and increases) the minimum wage on Labour Day. International Workers' Day was declared a national public holiday by the National Transitional Council in 2012 the first year of the post-Qaddafi era. On 1 May 1978, then Libyan leader Colonel Mu'ammar Al-Qaddafi addressed the nation in the capital city of Tripoli calling for administrative and also economic reforms across Libya. It is recognized as a public holiday on 1 May. Celebrates workers day on 1 May. Every 1 May, workers in Nigeria converge at the stadium to commemorate this public holiday. It is a recognized holiday all workers must observe. On that day the president of the Nigeria Labour Congress addresses workers and this has been a tradition for decades. In Somalia, 1 May is a public holiday and celebrated as the Labour Day. In South Africa, Workers' Day has been celebrated as a national public holiday on 1 May each year since 1994. It has its origins within the historical struggles of workers and their trade unions internationally for solidarity between working people in their struggles to win fair employment standards and more importantly, to establish a culture of human and worker rights and to ensure that these are enshrined in international law and the national law of those countries aligned to the International Labour Organization. In pre-1994 South Africa, the demand for the annual observance of the day as a public holiday became a rallying point for workers and their trade unions and was one of a number of annually significant days to symbolize and mobilize resistance to the Apartheid government and its racial policies. In Tanzania, it is a public holiday on 1 May and celebrated as the Workers' Day. May Day rally in Tunis, Tunisia. 1 May is recognized as Labour Day within Tunisia. In Uganda, Labour Day is a public holiday on 1 May. 1 May is recognized as public holiday in Zimbabwe. If the date is Sunday in that year, the following Monday is a holiday. In Argentina, Workers' Day is an official holiday, and is frequently associated with the labour unions. Celebrations related to labour are held, including demonstrations in major cities. The first Workers' Day celebration was in 1890, when Argentinian unions, controlled in those days by socialists and anarchists, organized several joint celebrations in Buenos Aires and other cities, at the same time that the international labour movement celebrated it for the first time. In 1930, it was established as an official holiday by the Radical Civic Union president Hipólito Yrigoyen. The day became particularly relevant during the worker-oriented government of Juan Domingo Perón (1946–55). He permitted and endorsed national recognition of the holiday during his tenure in office. 1 May is known as Labour Day and is a holiday. In Brazil, Workers' Day is an official holiday that is celebrated on the 1st of May, and unions commemorate it with day-long public events. It is also when salaries for most professional categories and the minimum wage are traditionally readjusted. A notice about an anti-capitalist rally on Worker's Day in Montreal, 2011. In Canada, Labour Day is celebrated in September. In 1894, the government of Prime Minister John Sparrow David Thompson declared the first Monday in September as Canada's official Labour Day. Labor Day in the United States is on the same day. May Day is however marked by unions and leftists. It is celebrated on the 1st of May. May Day is an important day of trade union and community group protest in the province of Quebec (though not a provincial state holiday). Celebration of the International Labour Day (or "International Workers' Day"; French: Journée internationale des travailleurs) in Montreal goes back to 1906, organized by the Mutual Aid circle. The tradition had a renaissance at the time of a mass strike in 1972. On the 1973 May Day, the first contemporary demonstration was organized by the major trade union confederations; over 30,000 trade unionists took part in this demonstration. Further, it is the customary date on which the minimum wage rises. President Carlos Ibáñez del Campo decreed 1 May a national holiday in 1931, in honour of the dignity of workers. All stores and public services must close for the entire day, and the major trade unions of Chile, represented in the national organization Workers' United Center of Chile (Central Unitaria de Trabajadores), organize rallies during the morning hours, with festivities and cookouts in the later part of the day, in all the major cities of Chile. During these rallies, representatives of the major left-wing political parties speak to the assemblies on the issues of the day concerning workers’ rights. 1 May has long been recognized as Labour Day and almost all workers respect it as a national holiday. As in many other countries, it is common to see rallies by the trade unions in all over the main regional capitals of the country. It is recognized as a public holiday, and at the same time an important day for government activities. On this day the President of Costa Rica gives a speech to the citizens and the legislature of Costa Rica about the duties that were undertaken through the previous year. The president of the legislature is also chosen by its members. This day is known as Labour Day in Cuba. People march in the streets, showing their support to the Cuban Communist government and the Cuban Revolution during the whole morning. 1 May is a national holiday known as Labour Day and celebrated by workers' parades and demonstration. In Ecuador, 1 May is an official public holiday known as Labour Day. People don't go to work and spend time with their relatives. It is an official holiday and it is commemorated with parades. 1 May is an official public holiday known as Labour Day. 1 May is an official public holiday known as Agriculture and Labour Day. 1 May is an official holiday, known as "Labour Day" within Honduras. 1 May is a federal holiday. It also commemorates the Cananea Strike of 1906 in the Mexican state of Sonora. 1 May is an official public holiday, known as "Labour Day" within Panama. 1 May is an official public holiday, known as "Labour Day" within Paraguay. 1 May is an official public holiday, known as "Labour Day" within Peru. In the United States, a "Labour Day", celebrated on the first Monday of each September was given increasing state recognition from 1887, and became an official federal holiday in 1894. Efforts to switch Labor Day from September to 1 May have not been successful. In 1921, following the Russian Revolution of 1917, 1 May was promoted as "Americanization Day" by the Veterans of Foreign Wars and other groups in opposition to communism. It became an annual event, sometimes featuring large rallies. In 1949, Americanization Day was renamed to Loyalty Day. In 1958, the US Congress declared Loyalty Day, the US recognition of 1 May, a national holiday; that same year, US President Dwight D. Eisenhower proclaimed 1 May Law Day as well. Music, theatre and giant puppets mark the Milwaukee May Day commemoration. Unions and radical organizations including anarchist groups and socialist and communist parties have kept the international May Day tradition alive with rallies and demonstrations. In 1919 the left mounted especially large demonstrations, and violence greeted the normally peaceful parades in Boston, New York, and Cleveland and a number of people were killed. In Milwaukee, an annual commemoration takes place at the site of the killing of seven workers during an 8 hour march. Some of the largest examples of this occurred during the Great Depression of the 1930s, when hundreds of thousands of workers marched in May Day parades in New York's Union Square, while cities like Chicago and Duluth saw large demonstrations organized by the communist party. In 2006, 1 May was chosen by mostly Latino immigrant groups in the United States as the day for the Great American Boycott, a general strike of undocumented immigrant workers and supporters to protest H.R. 4437, immigration reform legislation that they felt was draconian. From 10 April to 1 May of that year, millions of immigrant families in the US called for immigrant rights, workers' rights and amnesty for undocumented workers. They were joined by socialist and other leftist organizations on 1 May. On 1 May 2007, a mostly peaceful demonstration in Los Angeles in support of undocumented immigrant workers ended with a widely televised dispersal by police officers. In March 2008, the International Longshore and Warehouse Union announced that dockworkers will move no cargo at any West Coast ports on 1 May 2008, as a protest against the continuation of the Iraq War and the diversion of resources from domestic needs. On 1 May 2012, members of Occupy Wall Street and labor unions held protests together in a number of cities in the United States and Canada to commemorate May Day and to protest the state of the economy and economic inequality. On 1 May 2017, immigrants' rights advocates, labor unions and leftists held protests against the immigration and economic policies of President Donald Trump in cities throughout the US, Chicago and Los Angeles having some of the largest marches. In Uruguay, 1 May – Workers' Day – is an official holiday. Even when it is associated with labour unions, almost all workers tend to respect it. Since the late 1990s, the main event takes place at the First of May Square in Montevideo. 1 May is an official holiday in Venezuela. El Día del Trabajador is celebrated on 1 May in Venezuela since 1936, but from 1938 to 1945 it was held on 24 July, by an order of Eleazar López Contreras. However, Isaías Medina Angarita changed it back to 1 May in 1945. In Bahrain, 1 May is known as Labour Day and is a public holiday. In Bangladesh, May Day is a government holiday. All labour-oriented organizations celebrate the day with great honour and dignity. [tone] Schools and colleges under government jurisdictions enjoy holiday on this day. Labour Day is celebrated by the Communist Party of Bhutan. In Cambodia, it is known as International Labour Day and is a public holiday. Protest march in Macau, China, on 1 May 2010. 1 May is a statutory holiday in the People's Republic of China. Prior to 2008, it was a three-day holiday, but is now just the one day. However, it is usually supplemented by two other days to give the appearance of a three-day holiday, but not being statutory holidays the extra days have to be "made up" by working either the preceding or following weekend. For example, in 2013, 1 May fell on Wednesday. Most workplaces, including all government offices, took Monday 29 April, Tuesday 30 April, and Wednesday 1 May off. As the first two days were not statutory holidays they had to be "made up" by working the preceding weekend (27 and 28 April). International Worker's Day is also celebrated in China's special administrative regions. In Hong Kong, 1 May is known as Labour Day and has been considered a public holiday since 1999. In Macau, it is a public holiday and is officially known as Dia do Trabalhador (Portuguese for "Workers' Day"). In India, Labour Day is a public holiday held on every 1 May. It is celebrated as Antarrashtriya Shramik Diwas. The holiday is tied to labour movements for communist and socialist political parties. Labour Day is known as "Kamgar Din" in Hindi, "Karmikara Dinacharane" in Kannada,"Karmika Dinotsavam in Telugu, "Kamgar Divas" in Marathi, "Uzhaipalar dhinam" in Tamil, "Thozhilaali Dinam" in Malayalam and "Shromik Divas" in Bengali. In North India, Labour Day has lost some of its significance as a holiday. The Labour Kisan party has introduced May Day celebrations in Madras. Comrade Singaravelar presided over the meeting. A resolution was passed stating that the government should declare May Day as a holiday. The president of the party explained the non-violent principles of the party. There was a request for financial aid. It was emphasised that workers of the world must unite to achieve independence. 1 May is also celebrated as "Maharashtra Day" and "Gujarat Day" to mark the date in 1960, when the two western states attained statehood after the erstwhile Bombay State was divided on linguistic lines. Maharashtra Day is held at Shivaji Park in central Mumbai. Schools and offices in Maharashtra remain closed on 1 May. A similar parade is held to celebrate Gujarat Day in Gandhinagar. May Day (often referred locally as Labour Day) in Indonesia was first observed as a public holiday from 2014. Every year on the day, labourers take over the streets in major cities across the country, voicing their demands for better income & a supportive policy by the ministries. In Iran, 1 May is known as the International Workers' Day. It is not a public holiday but according to article 63 of Iranian labour law on top of the official public holidays observed in the Islamic Republic of Iran, Labour Day shall be considered an official holiday for workers. In Iraq, it is known as the International Workers' Day and is a public holiday. In the State of Israel, 1 May is not an official holiday. Avodah-affiliated organizations and the Histadrut recognize this international holiday. 2011 National Trade Union Council (Zenrokyo) May Day march, Tokyo. May Day is not officially designated by the Japanese government as a national holiday, but as it lies between other national holidays, it is a day off work for the vast majority of Japanese workers. Many employers give it as a day off, and otherwise workers take it as "paid leave". 1 May occurs during "Golden Week", together with 29 April ("Shōwa Day"), 3 May ("Constitution Memorial Day"), 4 May ("Greenery Day") and 5 May ("Children's Day"). Workers generally take the day off work not so much to join street rallies or labour union gatherings, but more to go on holiday for several consecutive days (in Japanese corporate culture, taking weekdays off for personal pleasure is widely frowned upon). Some major labour unions organize rallies and demonstrations in Tokyo, Osaka, and Nagoya. Japan has a long history of labour activism and since 1945, has had a communist and socialist party in the Diet. In 2008, the National Confederation of Trade Unions (Zenrōren) held a rally in Yoyogi Park attended by 44,000 participants, while the National Trade Unions Council (Zenrōkyō) held its May Day rally at Hibiya Park. Rengō, the largest Japanese trade union, held its May Day rally on the following Saturday (3 May), allegedly to distance itself from the more radical labour unions. 1 May is known as Labour Day and is a public holiday. 1 May is known as the Workers' Day and is a public holiday. From the 1960s through the 1990s, left-wing parties and workers' unions organized major marches on this day. Recently[when? ], only symbolic marches take place on this day. Malaysia began observing the holiday in 1972 following an announcement by the late Malaysian Deputy Prime Minister, Ismail Abdul Rahman. Maldives first observed the holiday in 2011, after a declaration by President Mohamed Nasheed. He noted that this move highlighted the government’s commitment as well as efforts of private parties to protect and promote workers’ rights in the Maldives. In Myanmar, 1 May is known as Labour Day (Burmese: အလုပ်သမားနေ့) and is a public holiday. May Day has been celebrated in Nepal since 1963. The day became a public holiday in 2007. In the Democratic People's Republic of Korea, 1 May is known as International Workers' Day, and is a public holiday. Celebrations, local meetings and rallies are held every year throughout the country to honor the holiday. The Rungnado May Day Stadium in the capital of Pyongyang was built in honor of the holiday. International Labour Day is observed in Pakistan on 1 May to commemorate the social and economic achievements of workers. It is a public and national holiday. All government and non-government organizations, factories and educational institutions remain closed on this day. Currently (2018), it is honoured by every single organization in Pakistan to give respect to all those who worked, to those who are working and those who played a part in social as well as economic conditions. Pakistan is a developing country but the current scenario has improved compared to previous times. However, workers still do not enjoy as many rights as enjoyed by workers in more developed/industrialized countries. Many organized street demonstrations take place on Labor Day, where workers and labor unions protest against labor repression and demand for more rights, better wages and benefits. 1 May is known as Labor Day (Filipino: Araw ng mga Manggaggawa) and is a public holiday in the Philippines. On this day, labour organizations and unions hold protests in major cities. On 1 May 1903, during the American colonial period the Unión Obrera Democrática Filipina (Filipino Democratic Labor Union) held a 100,000-person rally in front of the Malacañang Palace demanding workers' economic rights and Philippine independence. Ten years later, the first official[by whom?] celebration was held on 1 May 1913 when 36 labour unions convened for a congress in Manila. On 1 May 2001, a mass demonstration occurred near Malacañang Palace known as EDSA 3 or 1 May Riots. During the Presidency of Gloria Macapagal-Arroyo, a policy was adopted called holiday economics policy that moved holidays to either a Monday or a Friday to create a long weekend of three days. In 2002, Labor Day was moved to the Monday nearest to 1 May. Labour groups protested, as they accused the Arroyo administration of belittling the holiday. By 2008, Labor Day was excluded in the holiday economics policy, returning the commemorations to 1 May, no matter what day of the week it falls on. In Singapore, it is known as Labour Day and is a public holiday. In Sri Lanka, it is observed on 1 May and is a government and public holiday. The government has held official May Day celebrations in major towns and cities, with the largest being in the capital, Colombo. During celebrations, it is common to witness party leaders greeting the crowds. Workers frequently carry banners with political slogans and many parties decorate their vehicles. In Taiwan (officially known as the Republic of China), 1 May is an official public holiday known as Labour Day. In Thailand, the day is known in English as National Labour Day, and is one of 16 official public holidays in Thailand. In Vietnam, it is known as International Labour Day (Vietnamese: Ngày Quốc tế Lao động) and is a public holiday. It was first celebrated in 1913. Eastern Bloc countries such as the Soviet Union and most countries of central and eastern Europe that were under the rule of communist governments held official May Day celebrations in every town and city, during which party leaders greeted the crowds. Workers carried banners with political slogans and many companies decorated their company cars. The biggest celebration of 1 May usually occurred in the capital of a particular communist country and usually included a military display and the presence of the president and the secretary general of the party. In Poland, since 1982, party leaders led the official parades. In Hungary, May Day was officially celebrated under the communist regime, and remains a public holiday. Traditionally, the day was marked by dancing around designated "May trees". Some factories in communist countries were named in honour of International Workers' Day, such as 1 Maja Coal Mine in Wodzisław Śląski, Poland. Labour Day (Albanian: Dita e punëtorëve) is an official holiday celebrated on 1 May. People celebrate with friends and family at traditional picnics across the country, accompanied by the usual outdoor games, various grilled meats and beverages. Labour Day (Armenian: Աշխատանքի օր, ashxatanki or) is an official holiday celebrated on 1 May (day off). Labour Day (Tag der Arbeit), officially called Staatsfeiertag (state's holiday), is a public holiday in Austria. 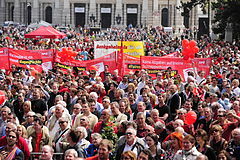 Left parties, especially social democrats organize celebrations with marches and speeches in all major cities. In smaller towns and villages those marches are held the night before. In Belgium, Labour Day (Dutch: Dag van de Arbeid, Feest van de Arbeid, French: Journée des travailleurs, Fête du travail), is observed on 1 May and is an official holiday. Various socialist and communist organizations hold parades in different cities. In Bosnia and Herzegovina, 1 and 2 May (Bosnian and Serbian: Prvi Maj / Први Mај, Croatian: Prvi Svibanj) are an official holiday and day-off for public bodies and schools at the national level. Most people celebrate this holiday by visiting natural parks and resorts. Additionally, in some places public events are organized. In its capital city, Sarajevo, June 12 and 13 are also celebrated as Labour day due to its many natural parks and springs. Labour Day is one of the public holidays in Bulgaria, where it is known as Labour Day and International Workers' Solidarity Day (Bulgarian: Ден на труда и на международната работническа солидарност). The first attempt to celebrate it was in 1890 by the Bulgarian Typographical Association. In 1939, Labour Day was declared an official holiday. Since 1945 the communist authorities in the People's Republic of Bulgaria began to celebrate the holiday every year. After the end of socialism in Bulgaria in 1989 Labour Day continues to be an official and public holiday, but state authorities are not committed to the organization of mass events. It is celebrated annually on 1 May. In Croatia, 1 May is a national holiday. People celebrate all over the country by gathering and cooking or barbecuing together. In Zagreb, the capital, most people go to Maksimir Park, which is located in the east part of Zagreb. In Split, the largest city on the coast, people go to Marjan, a park-forest at the western end of Split peninsula. Many public events are organized and held all over the country where bean soup is given out to all people as a symbol of a real workers' dish. During World War II in Yugoslavia in the Independent State of Croatia under the Ustashe fascist regime it was specially marked in honor of labour, social justice and solidarity of workers. In Cyprus, 1 May (Greek: Εργατική Πρωτομαγιά) is considered as an official Public Holiday (Labour Day). In general, all stores remain closed in public and private sector. The Labor Union and Syndicates celebrate with various festivals and events across the country. In the Czech Republic, 1 May is an official and national holiday known as Labour Day (Czech: Svátek práce). In Denmark, 1 May is not an official holiday, but many people, mostly in the public sector, construction industry, and production industry, get a half or a whole day off. The day is celebrated in the biggest cities with speeches from politicians, labour market organizations, grass roots, etc. In Finland, 1 May is an official and national holiday. Apart from Workers' Day (officially: suomalaisen työn päivä, "day of Finnish labour"), it is also celebrated as a feast of students, and spring, called vappu. In France, 1 May is a public holiday. It is, in fact, the only day of the year when employees are legally obliged to be given leave, save professions that cannot be interrupted due to their nature (such as workers in hospitals and public transport). Demonstrations and marches are a Labour Day tradition in France, where trade unions organize parades in major cities to defend workers' rights. It is also customary to offer a lily of the valley to friends or family. This custom dates back to 1561, where king Charles IX, aged 10, waiting for his accession to the throne, gave a lily of the valley to all ladies present. Today, the fiscal administration exempts individuals and workers' organizations from any tax or administrative duties related to the sales of lilies of the valley, provided they are gathered from the wild, and not bought to be resold. In Georgia, 1 May is a public holiday. In April 1933, the recently installed Nazi government declared 1 May the "Day of National Work", an official state holiday, and announced that all celebrations were to be organized by the government. Any separate celebrations by communists, social democrats or labour unions were banned. After World War II, 1 May remained a state holiday in both East and West Germany. In communist East Germany, workers were de facto required to participate in large state-organized parades on May Day. Today in Germany it is simply called "Labour Day" (Tag der Arbeit), and there are numerous demonstrations and celebrations by independent workers' organizations. Today, Berlin witnesses yearly demonstrations on May Day, the largest organized by labour unions, political parties and others by the far left and Autonomen. Annual street fairs have proven an effective way to prevent riots, and May Day in 2005 and 2006 have been among the most peaceful known to Berlin in nearly 25 years. In recent years, neo-Nazis and other groups on the far right, such as the National Democratic Party of Germany, have used the day to schedule public demonstrations, often leading to clashes with left-wing protesters, which turned especially violent in Leipzig in 1998 and 2005. May Day violence flared again in 2010. After an approved far right demonstration was blocked by leftists, a parade by an estimated 10,000 leftists and anarchists turned violent and resulted in an active response by Berlin police. In Greece 1 May is an optional public holiday. The Ministry of Labour retains the right to classify it as an official public holiday on an annual basis, and it customarily does so. The day is called Ergatikí Proto-magiá (Εργατική Πρωτομαγιά, lit. "Workers' 1 May") and celebrations are marked by demonstrations in which left-wing political parties, anti-authority groups and workers' unions participate. On May Day 2010 there were major protests all over Greece, most notably Athens and Thessaloniki, by many left, anarchist and communist supporters and some violent clashes with riot police who were sent out to contain the protesters. They opposed economic reforms, an end to job losses and wage cuts in the face of the government's proposals of massive public spending cuts. These reforms are to fall in line with the IMF-EU-ECB loan proposals, which demand that Greece liberalize its economy and cut its public spending and private sector wages, which many believe will decrease living standards. Hungary celebrates 1 May as a national holiday, with open-air festivities and fairs all over the country. Many towns raise May poles and festivals with various themes are organized around the holiday. As with other holidays, whenever 1 May falls on a Tuesday or Thursday the holiday officially becomes a long weekend when families take off to travel and hotels are booked full. Left-wing parties continue to hold public rallies commemorating Labour Day. In Iceland the Labour Day (Icelandic: Baráttudagur verkalýðsins) is a public holiday. However many stores nowadays are open and pay higher salaries to the workers instead on this day. A parade composed of trade unions and other groups marches through towns and cities across the country and speeches are delivered. The Irish Congress of Trade Unions (ITUC) marks May Day with rallies take place in Belfast and Dublin and other events such as lectures, concerts and film screenings also take place around a wider May Day festival. The first Monday in May has been a public holiday in the Republic of Ireland since 1994 and in Northern Ireland since 1978. In the Republic the public holiday was demanded by the ITUC and proposed by the Labour Party in negotiating its 1992–94 coalition government with Fianna Fáil, and marked the centenary of the ITUC's predecessor, the Irish Trades Union Congress. The public holiday has no official designation, as "Workers' Day" or otherwise. In 2005, Labour's Ruairi Quinn condemned, as a slight to workers, an alleged Fianna Fáil proposal to replace the May holiday with one on April 24 commemorating the 1916 Rising; in fact the proposal was for an extra holiday. The first May Day celebration in Italy took place in 1890. It started initially as an attempt to celebrate workers' achievements in their struggle for their rights and for better social and economic conditions. It was abolished under the Fascist regime and immediately restored after the Second World War. (During the fascist period, a "Holiday of the Italian Labour" (Festa del lavoro italiano) was celebrated on 21 April, the date of Natale di Roma, when ancient Rome was allegedly founded.) May Day is now an important celebration in Italy and is a national holiday regardless of what day of the week it falls. The Concerto del Primo Maggio ("1st of May Concert"), organized by Italian labour unions in Rome in Piazza di Porta San Giovanni has become an important event in recent years. Every year the concert is attended by a large audience of mostly young people and involves the participation of many famous bands and songwriters, lasting from 3 pm until midnight. The concert is usually broadcast live by Rai 3. First May Day is an official public holiday celebrated as International Work Day (Lithuanian: Tarptautinė darbo diena). First official celebrations appeared during Soviet occupation, but it had negative communist connotation. As Lithuania declared its independence in 1990, Work Day lost its public holiday status, but regained it in 1996. In Luxembourg, 1 May, called the Dag vun der Aarbecht ("Day of Labour"), is a legal holiday traditionally associated with large demonstrations by trade unions in Luxembourg City and other cities. Many people seize the opportunity for an outdoor picnic with family and friends, and local and national associations organize popular events for this day, among others the Festival of Labour and Cultures, organized by the Abbey Cultural Exchange Centre in Luxembourg City. In Malta, 1 May is an official public holiday celebrated as "Workers' Day", together with the religious feast of "Saint Joseph the Worker". (Saint Joseph's Day, 19 March, the saint's main feast, is also a public holiday in Malta.) A free music event takes place on 1 May. The Maltese also celebrate Maltese accession to the European Union on 1 May 2004. In the Netherlands, 1 May is not an official holiday. However, several left-wing political parties and organizations celebrate International Workers' Day yearly. Small demonstrations are sometimes held, mostly by anarchist and radical socialist groups. One of the reasons labour day never got established as a national holiday might have been the fact that the day that used to immediately precede it, Queen's Day (now King's Day at 27 April), was already a public holiday in its own right. First May Day celebration of the Ottoman period in Skopje, 1909. In North Macedonia, 1 May (Macedonian: Ден на Трудот, Den na Trydot) is an official public holiday. People celebrate with friends and family at traditional picnics across the country, accompanied by the usual outdoor games, various grilled meats and beverages. Left organizations and some trade unions organize protests on 1 May. Norway's former Prime Minister Jens Stoltenberg gives his 1 May speech in 2009 in Oslo, Norway. In Norway, Labour Day (Norwegian: Arbeidernes Dag) is celebrated 1 May and is an official public holiday. It is traditionally a day of marches, speeches and parties organized by labour unions, leftist political parties and feminist and anti-racist organizations to voice political concerns and celebrate solidarity. In Poland, since the fall of communism, 1 May is officially celebrated as May Day, but is commonly called Labour Day. it is currently celebrated without a specific connotation, and as such it is May Day. However, due to historical connotations, most of the large organized celebrations are focused around Labour Day festivities. It is customary for labour activists to organize parades in cities and towns across Poland. The holiday is also commonly referred to as "Labour Day" (Polish: Święto Pracy). In Poland, May Day is closely followed by May 3rd Constitution Day. These two dates combined often result in a long weekend called Majówka, which may last for up to 9 days from the 28th of April to the 6th of May, at the cost of taking only 3 days off. People often travel, and Majówka is unofficially considered the start of barbecuing season in Poland. Between these two, on 2 May, there is a patriotic holiday, the Day of the Polish Flag (Dzień Flagi Rzeczypospolitej Polskiej), introduced by a Parliamentary Act of 20 February 2004. The day, however, does not force paid time off. In Soviet times, streets, places, squares, parks and also factories were frequently named in honor of International Workers' Day, such as 1 Maja Coal Mine in Wodzisław Śląski. In Portugal, the 1 May celebration (Portuguese: Primeiro de Maio) was harshly repressedduring the long right wing dictatorship of António de Oliveira Salazar and Marcelo Caetano. Since the Carnation Revolution on 25 April 1974, the Worker's Day is celebrated by unions but as well by several leftist political parties with parades and demonstrations. The first demonstration after the Carnation Revolution, only one week after the coup, stays until today as the biggest demonstration in the history of Portugal. It is an opportunity for workers, including non-permanent workers' groups, to show their discontent for existing working conditions in parades all over the country but mainly in the capital, where the two main national union federations (communist CGTP-IN and centre-left UGT) organize two different rallies (in Alameda D. Afonso Henriques and Torre de Belém). It is an official public holiday. Delegates of the Romanian Communist Party on 1 May 1965. In Romania, 1 May, known as the International Labour Day (Romanian: Ziua internațională a muncii), the International Workers' Day (Ziua internațională a oamenilor muncii), or simply 1/First of May (1/Întâi Mai), is an official public holiday. During the communist regime, like in all former Eastern Bloc countries, the day was marked by large state-organized parades in most towns and cities, to which many workers were de facto required to participate. After the Romanian Revolution of 1989, 1 May continues to be an official public holiday, but without any state organized events or parades. Most people celebrate together with friends and family, organising picnics and barbecues. It is also the first day of the year when people, especially those from the southeastern part of the country including the capital Bucharest, go to spend the day in one of the Romanian Black Sea resorts. Russian Communist Workers' Party demonstration on 1 May 2008 in Izhevsk. May Day was celebrated illegally in Russia until the February Revolution enabled the first legal celebration in 1917. The following year, after the Bolshevik seizure of power, the May Day celebrations were boycotted by Mensheviks, Left Socialist Revolutionaries and anarchists. It became an important official holiday of the Soviet Union, celebrated with elaborate popular parade in the centre of the major cities. The biggest celebration was traditionally organized in Red Square, where the General Secretary of the CPSU and other party and government leaders stood atop Lenin's Mausoleum and waved to the crowds. In 1991, which preceded the last year that demonstrations were held in Red Square, May Day grew into high-spirited political action. Around 50,000 people participated in a rally in Red Square in 1991 after which the tradition was interrupted for 13 years. In the early post-Soviet period the holiday turned into massive political gatherings of supporters of radically minded politicians. For instance, an action dubbed as "a rally of communist-oriented organisations" was held in Red Square in 1992. The rally began with performance of the Soviet Union anthem and raising the Red Flag and ended with appeals from the leader of opposition movement Working Moscow, Viktor Anpilov, "for early dismissal of President Boris Yeltsin, ousting Moscow Mayor Gavriil Popov from power and putting the latter on trial". Since 1992, May Day is officially called "The Day of Spring and Labour", and remains a major holiday in present-day Russia. In Serbia, 1 May (and also 2 May) is a day off work and a day out of school. It is one of the major popular holidays, and the only official holiday from socialist times that is still officially celebrated. People celebrate it all over the country. By tradition 1 May is celebrated by countryside picnics and outdoor barbecues. May is marked by warm weather in Serbia. In Belgrade, the capital, most people go to Avala or Košutnjak, which are parks located in Rakovica and Čukarica. People go around the country to enjoy nature. A major religious holiday of Djurdjevdan is on 6 May so quite often days off work are given to connect these two holidays and weekend, creating a small spring break. 1 May is celebrated by most of the population regardless of political views. In Slovakia, 1 May is a day off work and a day out of school. Celebrations are usually connected also with the commemoration of the entry of the Slovak Republic into the European Union (1 May 2004). In Slovenia, 1 May (and also 2 May) is a day off work and a day out of school. There are many official celebrations all over the country. In Ljubljana, the capital, many people go to Rožnik Hill in the city. On the night of 30 April, bonfires are burned on many hills. May Day rally in Barcelona, Spain. In Spain, the 1 May celebration was established after the death of Francisco Franco in 1975; before that, it had been celebrated during the Spanish Second Republic period (1931–1939), but it was banned afterwards by the Franco regime. The first time it was celebrated was in 1977, when the Communist Party of Spain was legalized. Since then, it has become an official holiday that has been traditionally used by trade unions and leftist parties for social and labour vindications. Commonly, peaceful demonstrations and parades occur in major and minor cities. Swedish Social Democratic Party at May Day demonstration in Stockholm, Sweden in 2006. The party has dominated Swedish politics for nearly a century. The trade union palace in Stockholm is seen at the end of the picture. 1 May has been an important part of Swedish history since the late 19th century. The day was made a public holiday in 1938 but had been celebrated by the Swedish Social Democratic Party and the left since 1890. The first May Day celebration gathered more than 50,000 people in central Stockholm. The crowd went to hear speeches by the leading figures in the Swedish labour movement such as Hjalmar Branting (later prime minister), August Palm and Hinke Bergegren. During World War I the demonstrations mainly had a peace message and the Liberal Party also joined the demonstrations. The 8-hour working day and women's suffrage were the principal themes during the troubled times after World War I.
Recognizing the central contributions of workers and international worker solidarity in Swedish social, economic, political and cultural development, May Day demonstrations are an important part of Swedish politics and culture for social democrats, left parties, and unions. In Stockholm the Social Democratic Party always marches towards Norra Bantorget, the historical, physical centre of the Swedish labour movement, where they hold speeches in front of the headquarters of the Swedish Trade Union Confederation, while the smaller Left Party marches in larger numbers towards Kungsträdgården. Since 1967, the Communist Party and its youth wing, Revolutionary Communist Youth, have held their own May Day march, known as Röd Front ('Red Front'). In 2016, Röd Front marches were held at 33 locations across the country. The largest Röd Front marches are usually held in the industrial and financial port town of Gothenburg, Sweden's second-largest city and one of the party's strongholds. In Switzerland, the status of 1 May differs depending on the canton and sometimes on the municipality. Labour Day is known as Tag der Arbeit in German-speaking cantons, as Fête du travail in the French-speaking cantons, and as Festa del lavoro in the Italian-speaking canton of Ticino. In the cantons of Basel-Landschaft, Basel-Stadt, Jura, Neuchâtel, and Zürich, Labour Day is an official public holiday equal to Sundays, based on federal law (Bundesgesetz über die Arbeit in Industrie, Gewerbe und Handel, article 20a). In the cantons of Schaffhausen, Thurgau, and Ticino, Labour Day is an official "day off" (Ruhetag). This is equal in practice to an official public holiday, but is not based on federal law and cantonal regulations may differ in details. In the canton of Solothurn it is an official half-day holiday (starting at 12 noon). In the canton of Fribourg, public servants get the afternoon off, many companies follow this practice. In the canton of Aargau it is not an official holiday, but most employees get the afternoon off. In the municipalities of Hildisrieden and Schüpfheim (both in the canton of Lucerne) as well as in Muotathal (canton of Schwyz), 1 May is an official public holiday, but as commemoration day of the local patron saint, not as Labour Day. In the other parts of the cantons of Lucerne and Schwyz, 1 May is a regular work day. In all other cantons, 1 May is a regular work day. The largest Labour Day celebrations in Switzerland are held in the city of Zürich. Each year, Zürich's 1 May committee, together with the Swiss Federation of Trade Unions, organizes a festival and 1 May rally. It is the largest rally held on a regular basis in Switzerland. 1 May is an official holiday celebrated in Turkey. It was a holiday until 1981 when it was cancelled after the 1980 coup d'état. In 2010, the Turkish government restored the holiday after some casualties and demonstrations. Taksim Square is the centre of the celebrations due to the Taksim Square massacre. Workers' Day was first celebrated in 1912 in İstanbul, in 1911 in Selânik and in 1899 in İzmir. After the establishment of the Turkish Republic, it became an official holiday. In 1924, it was forbidden by a decree and in both 1924 and 1925, demonstrations were intervened by arm floats. In 1935, The National Assembly declared Workers' Day to be a holiday again. During the events leading to the 1980 Turkish coup d'etat, a massacre occurred on 1 May 1977 (Taksim Square massacre), in which unknown people (agents provocateurs) opened fire on the crowd. The crowd was the biggest in Turkish workers' history with the number of people approximating 500,000. In the next two years, provocations and confusion continued and peaked before the 1980 coup d'etat. The Workers' Day holiday was cancelled once again. Still, demonstrations continued with small crowds, and in 1996, three people were killed by police bullets, and a plain-clothes man who spied in the crowd was revealed and lynched by workers. On the same evening, a video broadcast on TV showed that two participants in the demonstration were lynched by far right-wing nationalist groups and this lynching occurred in front of police forces who were watching the scene with happy faces. Thus, 1 May 1996 has been remembered by workers' movements. In 2007, the 30th anniversary of the Taksim square massacre, leftist workers' unions wanted to commemorate the massacre in Taksim square. Since the government would not let them into the square, 580–700 people were stopped and 1 person died under police control. After these events, the government declared 1 May as "Work and Solidarity Day" but not as a holiday. In the next year, the day was declared as a holiday, but people were still not allowed to gather in Taksim Square. The year 2008 was remembered with police violence in Istanbul. Police fired tear gas grenades among the crowds, and into hospitals and a primary school. Workers pushed forward so that in 2010, 140,000 people gathered in Taksim, and in 2011 there were more than half a million demonstrators. After 3 years of peaceful meetings in 2013, meetings in Taksim Square were forbidden by the government. Clashes occurred between police and workers; water cannon and tear gas have been widely used. It is a public holiday in Ukraine, inherited from the Soviet era. Until 2018 May 2 was also a public holiday (as in the Soviet era), instead in 2017 Western Christianity's Christmas celebrated 25 December become a new Ukrainian public holiday. 1 May's International Workers' Day remained a Ukrainian public holiday, although it was renamed (also in 2017) from "Day of International Solidarity of Workers" to "Labour Day". In 2015, May Day rallies were banned in Kyiv and Kharkiv. Late May 2015 laws that ban communist symbols came into effect in Ukraine, thus banning communist symbols, singing the Soviet national hymn or the Internationale. According to Interior Minister Arsen Avakov during the 2016 May Day rallies in some major cities the number of police officers far outnumbered the number of rally participants. With in Dnipro 193 policemen protecting 25 rally participants. The Stalin banner belonging to the CPGB-ML, featured in every London International Workers' Day rally since 2008. The spring bank holiday in the United Kingdom known as May Day was created in 1978 and is held on the first Monday in May each year. There are many traditional May Day rites and celebrations, some of which have been held for hundreds of years. However, it wasn't until the late 20th century that May Day in Great Britain became linked to International Workers' Day, and the holiday is not officially a "Labour Day". In recent years, the anti-capitalist movement has organized a number of large protests in London, Glasgow, Edinburgh, and Doncaster. In London, these have resulted in clashes with the police. In 2000, the clashes ended with a branch of McDonald's being smashed and a statue of Winston Churchill being given a grass Mohawk hairstyle. The Cenotaph was also defaced with graffiti. In the last few years, demonstrations have been more peaceful, with marches and gatherings, particularly in central London. The Conservative-led coalition government in March 2011 announced plans to move the May Day bank holiday to October to lengthen the tourist season, although as of 2017 nothing had come of this. A London rally on May Day is organized by the London May Day Organising Committee. The Labour Day March in Brisbane, Queensland is the largest rally in Australia. While unofficial activities and commemorations associated with International Workers Day occur on May Day in Australia, Labour Day in the various states and territories generally falls on other days. Only in the Northern Territory (where it is called May Day) and Queensland is Labour Day celebrated on the first Monday in May, which is a public holiday under the name of "May Day". Queensland holds the biggest rallies in Australia, with the rally in Brisbane averaging 30,000 people. There are also rallies held in Cairns, Rockhampton, Townsville, Barcaldine, Ipswich, Toowoomba and other regional centres. New Zealand workers were among the first in the world to claim the right for an eight-hour working day when, in 1840, the carpenter Samuel Parnell won an eight-hour day in Wellington. Labour Day was first celebrated in New Zealand on 28 October 1890. Labour day falls every year on the fourth Monday of October. ^ "In 1884 the first Monday in September was selected as the holiday, as originally proposed"
^ I saw a man, whom I afterwards identified as Fielding [sic], standing on a truck wagon at the corner of what is known as Crane's Alley. I raised my baton and, in a loud voice, ordered them to disperse as peaceable citizens. I also called upon three persons in the crowd to assist in dispersing the mob. Fielding got down from the wagon, saying at the time, "We are peaceable," as he uttered the last word, I heard a terrible explosion behind where I was standing, followed almost instantly by an irregular volley of pistol shots in our front and from the sidewalk on the east side of the street, which was immediately followed by regular and well directed volleys from the police and which was kept up for several minutes. I then ordered the injured men brought to the stations and sent for surgeons to attend to their injuries. After receiving the necessary attention most of the injured officers were removed to the County Hospital and I highly appreciate the manner in which they were received by Warden McGarrigle who did all in his power to make them comfortable as possible. ^ 5월 1일을 근로자의 날로 하고 이 날을 "근로기준법"에 의한 유급휴일로 한다. ("The first day of May each year shall be designated as Workers' Day, which shall be a paid holiday under the 'Labor Standards Act'.)" ^ a b "May 1 not covered by 'holiday economics'". GMA News Online. 14 April 2008. Retrieved 1 May 2012. ^ a b About Labour Day in Algeria Labour Day Holiday Resource. ^ Rothman, Lily (1 May 2017). "The Bloody Story of How May Day Became a Holiday for Workers". Time. Time Magazine. Retrieved 2 May 2017. ^ Grant, Jordan. "May Day: America's traditional, radical, complicated holiday". The National Museum of American History. Retrieved 2 May 2017. ^ "The Brief Origins of May Day". IWW Historical Archives. Industrial Workers of the World. Retrieved 2 May 2014. ^ a b c Foner, Philip S. (1986). May Day: A Short History of the International Workers' Holiday, 1886–1986. New York: International Publishers. pp. 41–43. ISBN 978-0-7178-0624-9. ^ a b "United States Department of Labor: The History of Labor Day". Archived from the original on 3 September 2011. Retrieved 2 September 2011. ^ a b The Bridgemen's magazine. International Association of Bridge. Structural and Ornamental Iron Workers. 1921. pp. 443–44. Retrieved 4 September 2011. ^ "The Canadian Encyclopedia: Origins of Labour Day". Retrieved 5 September 2011. ^ a b Knights of Labor. Progressive Historians (3 September 2007). ^ Rothman, Lily (1 May 2017). "The Bloody Story of How May Day Became a Holiday for Workers". Time. Retrieved 18 March 2018. ^ "Act II: Let Your Tragedy Be Enacted Here". The Dramas of Haymarket. Chicago Historical Society. 2000. Retrieved 30 December 2017. ^ Ward, William (24 May 1886). "Letter from Captain William Ward to Inspector John Bonfield". Haymarket Affair Digital Collection. Chicago Historical Society. Retrieved 30 December 2017. ^ a b "Bay View Tragedy". Wisconsin Labor History Society. 6 November 2009. Retrieved 11 May 2016. ^ "Saint Joseph". Retrieved 5 July 2010. ^ a b c "May Day". www.ghanatuc.org. Retrieved 30 August 2018. ^ The transitional government on Tuesday announced a public holiday in all parts of Libya on the occasion of International Workers' Holiday. The Libyan government transition – Prime Minister's Office (in Arabic). ^ Address to the nation and call for reforms by Muammar Qaddafi, marking celebrations of International Workers' Day on 1 May 1982 Mathaba News Network – Archive: Democracy in Industry. Retrieved 1 May 2012. ^ "Primero de Mayo en la Argentina. Elhistoriador.com.ar. Retrieved on 1 May 2013. ^ Día del Trabajador y día de la Tradición: Dia del trabajador. Tradibajor.blogspot.de. Retrieved on 1 May 2013. ^ En Bolivia, el festejo del 1 de mayo se consolidó en 1907. La Razón (1 May 2016). Retrieved on 1 May 2017. ^ "Québec's minimum wage will exceed the $10 an hour mark on May 1, 2013 : Québec Portal". Gouv.qc.ca. Retrieved 17 December 2013. ^ Días Feriados en Chile (in Spanish). feriadoschilenos.cl. Retrieved on 1 May 2013. ^ "SOCIALISTS' MAY DAY PARADE" (VOLUME LXV, ISSUE 134). AUCKLAND STAR. 8 June 1934. Retrieved 2 May 2017. ^ "CHICAGO'S BOMBS" (VOLUME LXIV, ISSUE 102). AUCKLAND STAR. 3 May 1933. Retrieved 2 May 2017. ^ Protest du Jour: May Day is rally day in Seattle | Seattle's Big Blog – seattlepi.com. Blog.seattlepi.com (1 May 2008). Retrieved on 1 May 2013. ^ March smaller, but festive – Los Angeles Times. Articles.latimes.com (2 May 2008). Retrieved on 1 May 2013. ^ May Day 2013 NYC | Another World is Possible. Maydaynyc.org (5 January 2013). Retrieved on 1 May 2013. ^ de beste bron van informatie over occupymay1st. Deze website is te koop!. occupymay1st.org. Retrieved on 1 May 2013. ^ Peoples, Steve; Taxin, Amy (1 May 2017). "Thousands of people in US rally for workers, against Trump". The Washington Post. Associated Press. Retrieved 1 May 2017. ^ Yee, Vivian (1 May 2017). "On May Day, Protesters Take to the Streets Nationwide". The New York Times. Retrieved 1 May 2017. ^ Día del Trabajador en Venezuela – Magazine Digital. Magazine.com.ve (30 July 2007). Retrieved on 1 May 2013. ^ "Holidays - Reserve Bank of India". Reserve Bank of India. 1 May 2014. Retrieved 1 May 2014. ^ "Achievements". Singaravelar. Archived from the original on 21 April 2011. Retrieved 1 May 2011. ^ "India Observes International Labor Day - India Real Time - WSJ". Blogs.wsj.com. 1 May 2012. Retrieved 17 December 2013. ^ "Workers need more than a holiday on May Day: Unions". The Jakarta Post. 1 May 2013. Retrieved 17 December 2013. ^ "Commemorating Labour Day in Malaysia". Malaya History. 1 May 2008. Retrieved 6 September 2010. ^ "Haveeru Online – Maldives declares Labour Day a public holiday". Haveeru.com.mv. 27 April 2011. Archived from the original on 30 April 2011. Retrieved 1 May 2011. ^ 113th May Day being observed today. Nepalnews.com (April 2002). ^ May Day being observed across the country. Nepalnews.com (1 May 2008). ^ a b "Did you know". Philippine Daily Inquirer. 30 April 2012. Retrieved 1 May 2012. ^ "Gloria draws flak on holidays". Philippine Daily Inquirer. 12 April 2002. Retrieved 1 May 2012. ^ "Designation of Workers' Day Act". Statutes of Republic of Korea. ^ "Mayday traditions and events in Hungary". Caboodle.hu. 30 April 2007. Retrieved 1 May 2011. ^ "Fêtes légales et jours fériés" (in French). Government of France. 24 April 2012. Archived from the original on 3 May 2012. Retrieved 1 May 2012. ^ Tbilisi Municipal Portal – Public Holidays. Tbilisi.gov.ge. Retrieved on 1 May 2013. ^ "Police battle rioters in May Day clashes". Deutsche Welle. 2 May 2010. Retrieved 21 June 2010. ^ "Celebrations and Public Holidays" (in Greek). IKA Review of Insurance and Labour Law. Retrieved 1 May 2013. ^ "Protesters confront Greek police". BBC News. 1 May 2010. ^ "S.I. No. 91/1993 - Holidays (Employees) Act, 1973 (Public Holiday) Regulations, 1993". Irish Statute Book. Retrieved 8 May 2018. ^ "RTÉ Archives: May Day Why Not A Holiday?". RTÉ.ie. 29 April 2015. Retrieved 8 May 2018. ^ Quinn, Ruairí (9 July 1993). "Vote 44: An Chomhairle Ealaíon". Dáil Éireann Debates. Oireachtas. pp. Vol.433 No.8 p.61 c.2084. Retrieved 8 May 2018. The Programme for a Partnership Government also committed the Government to appoint the first Monday in May to be a public holiday with effect from 1994, in recognition of the centenary of the foundation of the Irish Trades Union Congress. In deciding to introduce a new public holiday, the Government also took account of the fact ... that nine of our EC partners have a public holiday early in May. ^ "Public holidays". Dublin: Citizens Information Board. 20 March 2018. Retrieved 8 May 2018. ^ "Fianna Fáil denies plan to axe bank holiday". Irish Examiner. 24 October 2005. Retrieved 9 May 2018. ^ a b "Public Holidays in Malta". Government of Malta. 2018. Retrieved 9 May 2018. ^ "May Day in Poland". Archived from the original on 15 August 2012. Retrieved 1 May 2013. ^ "Poland's Holidays". Retrieved 1 May 2013. ^ Jonas Sjöstedt talar på Sveriges största första maj-firande | Vänsterpartiet Storstockholm. Storstockholm.vansterpartiet.se. Retrieved on 1 May 2013. ^ "Röd Front 40 år". Proletären. 24 April 2007. Retrieved 26 April 2017. ^ "Röd Front 2016 i bilder". Kommunistiska Partiet. Retrieved 26 April 2017. ^ "Röd Front runt om i landet". Kommunistiska Partiet. Retrieved 26 April 2017. ^ Rothelius, Lars (1 May 2015). "Röd front 1 maj 2015". Proletären. Retrieved 26 April 2017. ^ a b İşgünü Mücadelesi ve 1 Mayıs’ın Doğuşu | sınıf mücadelesinde Marksist Tutum. Marksist.com. Retrieved on 1 May 2013. ^ Ulusal bayram ve genel tati̇ller hakkında kanunda. rega.basbakanlik.gov.tr (22 April 2009). ^ "Clashes mar International Workers' Day in Turkey | euronews, world news". Euronews.com. Retrieved 17 December 2013. ^ "Ukraine seeks distance from Moscow with new Christmas holiday". m.digitaljournal.com. Retrieved 16 November 2017. ^ a b (in Ukrainian) "Рада зробила 25 грудня вихідним днем". BBC Україна. 16 November 2017. Retrieved 16 November 2017. ^ "Kharkiv court bans Communist march, rally on May 1". Kyiv Post. 24 April 2015. ^ "Ukraine bans Soviet symbols and criminalises sympathy for communism". The Guardian. 21 May 2015. Retrieved 30 June 2015. ^ "Violence at May Day protest". BBC News. 1 May 2000. Retrieved 1 May 2011. ^ Rutherford, Jonathan (2002). "After Seattle". Review of Education, Pedagogy and Cultural Studies. 24 (1–2): 13–27. doi:10.1080/10714410212924. ^ "Workers in London May Day march". BBC News. 1 May 2006. Retrieved 1 May 2011. ^ "May Day bank holiday plans unveiled". BBC News. 4 March 2011. ^ "Samuel Parnell | NZHistory, New Zealand history online". nzhistory.govt.nz. Retrieved 30 August 2018. ^ "Labour Day | NZHistory, New Zealand history online". nzhistory.govt.nz. Retrieved 30 August 2018. Foner, Philip Sheldon (1986). May day: a short history of the international workers' holiday, 1886–1986. New York: International Publishers. ISBN 978-0-7178-0624-9.